"The volunteers and our guests consider ourselves a family -- Mother Marianne's family," Montalbano said. "I can't think of a bigger Blessing than to be with family and friends, especially at Christmas. We consider it an honor to serve a meal to our hungry neighbors. After all, it is our Lord's guest list and ALL are welcome!" The soup kitchen serves meals from 11:30 a.m. to 12:30 p.m. Located at St. Joseph-St. Patrick Parish Center at Columbia and Varick streets, the soup kitchen is named after parish daughter Bl. Mother Marianne Cope, missionary to the lepers of Hawaii's Molokai. "We already have plenty of volunteers who want to help out on Christmas," Montalbano said, "including help with preparation of the hot food by Leaf, Loaf and Ladle at RCIL." 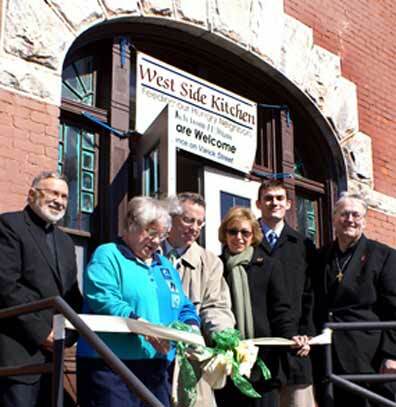 Food Prep Coordinator Bob Oderkirk noted that Leaf, Loaf and Ladle, a culinary training program and catering service, has cooked all the Thanksgiving and Christmas dinners for Mother Marianne's West Side Kitchen since the soup kitchen opened in 2008. He lauded Leaf, Loaf and Ladle Program Director Debra Richardson and Chef Trainer Michael Cappelli for "their eagerness to help make Christmas a little merrier for the working poor, the unemployed and the homeless who come to Mother Marianne's soup kitchen." "Anyone interested in donating or helping out may check out our website, WestSideKithen.org, or call 315-735-4429 and leave a message," Montalbano said.